The final collaboration of Richard Strauss and librettist Hugo von Hofmannsthal, Arabella is either a deceptively grim meditation on love in society, a typical comedy of manners, a proto-feminist parable of the volatile position of women in the marriage market, or a light and frothy romance. Sometimes it can be all of these things at once. 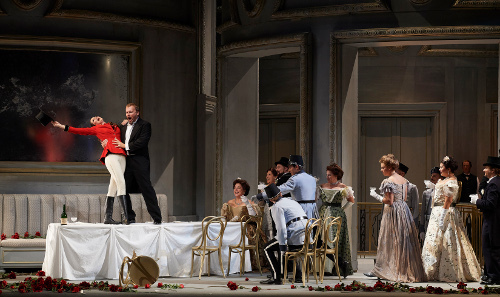 I’m not entirely sure which The Canadian Opera Company‘s adaptation of Strauss’ Arabella wants to be — but that very ambiguity is what makes it interesting. Arabella (Erin Wall) and Zdenka (Jane Archibald) are two sisters whose family, though aristocratic, is totally broke. All the Waldners are relying on Arabella to marry a rich suitor (of which she has dozens), while they hide Zdenka away in men’s clothes to avoid the expense of a second daughter on the marriage market. Zdenka wants Arabella to marry Matteo (Michael Brandenburg), who she herself loves in secret; Arabella is determined only to marry for love. Naturally, love soon arrives in the form of Mandryka (Tomasz Konieczny), a Croation landowner whose rural charms and serious eyes capture Arabella’s heart instantly. What follows is a series of mistaken identities, mismatched lovers, and an interplay of deceit and forgiveness. When you enter the Four Seasons Centre, the scene has already been set as we take in the Waldners’ whitewashed hotel room in Vienna, itself relatively sparse and bare. This sets the tone for the rest of the production, visually speaking: everything is very washed-out, with pale white tones, delicate greys, and simple tuxedo-blacks. The set itself — a series of revolving pieces that transform into hotel room, ballroom, and hotel lobby — is generically palatial, and while the simplicity never distracts, it doesn’t really find a strong visual identity. Something about the dullness of the set undercut my expectation of a sparkling, seductive Vienna that robs people of their hearts and wallets in equal measure. Instead, the city feels dried-out and washed raw, with its residents bursting for any hints of passion and romance. If nothing else, it forefronts the massive talent filling the Four Seasons stage. And the performances are powerful, nimble and multifaceted. Certainly, the stars of the show are the sister-pair of Arabella and Zdenka, played with complex emotion and poignant longing by Wall and Archibald. Wall’s elegant soprano gives Arabella a depth of dignity and grace, even as she transitions from a youthful maid, caught up in the whirl of Vienna flirtation, to the grim defender of her own honour. Archibald, meanwhile, is tomboyish and appealingly open-hearted. Both sopranos ache with stirring vocals and expressive acting, and they shine particularly together. My favourite singing took place between the two sisters, as their warm and generous love for one another complicates their passionate longings for their own love and happiness. Both Wall and Archibald handle these competing complexities of sisterhood with a lovely authenticity. Tomasz Konieczny, meanwhile, has (in my opinion) one of the more difficult parts in the piece: the role of Mandryka, Arabella’s rural lover. His work in Act One was charmingly lovesick and anxious, writhing head-to-toe with shyness as he admits to having fallen in love with Arabella’s picture. However, the character starts to show a potentially darker side in Acts Two and Three, when misunderstandings prompt him to think Arabella has been unfaithful to him. Konieczny handles this transition ably, but the character itself is a little unsettling: quick to turn on his lover, his rapid and bitter temper (and excessive drinking) remains a stark reminder of how unstable the lives and reputations of women in the marriage market could be. All of this adds up to an intriguingly grey opera, in both the visuals and the themes. Is it, in the end, about the corruptions of society versus the purity of a rural ideal? Is it a rumination on ‘real’ love and connection in a modern urban world? A parable dealing with the tenuous position of women as marriage objects? A simple comedy of manners that I’m reading way too much into? The thing is, I don’t think it’s a bad thing that I can’t totally pin down this opera. I think it allows for multiple interpretations, and the Canadian Opera Company gives all of them space to breathe with its greyish canvas filled with captivating talent. It’s a deceptively complex adaptation, and while I can’t say it feels totally cohesive, that lack of cohesion is precisely why it intrigues. Show times are 7:30 pm on the 18th, 20th and 28th and one matinee on the 22nd at 2 pm. Photo of Claire de Sévigné as the Fiakermilli and Tomasz Konieczny as Mandryka by Michael Cooper.